OK, I'm Jamie Murray from Scotland (bonnie Moray coast) and to put it bluntly (don't be offended) I hate modern music! A general rule of thumb with me is anything made past 1990 is not worth my listening to. And the list really could go on, believe me. So, that's pretty much it. Oh and I collect Vacuum Cleaners! As for the title in case you were wondering is to express my hate for music downloads. I like to have my music physically on my person. Be it vinyl records (my favourite), cassettes (second favourite) or Compact Disks (my least favourite). Music downloads are just not for me, I don't like to rely on a computer or an MP-thingy ma jiggy to keep my music safe. I want it HERE where I can actually see it. So you don't listen to anything post-1990? Ha ha ha, I sure will won't I. There is a section for older music I assume ? 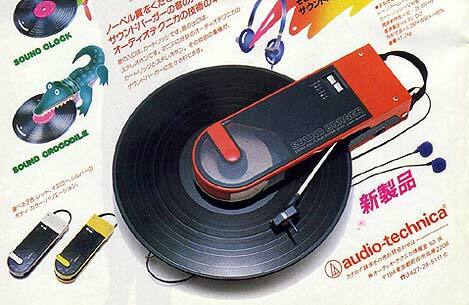 They've invented a portable vinyl player? I like a lot of older music... and a lot of newer music. Welcome aboard! Also, are you sure you should be using the internet, can't you get this kind of discussion over the wireless or down at the Miner's club?